Nova Science Publishers now introduce an interesting book on research to help reduce global tobacco-related diseases in four volumes. Volume One describes general topics on nicotinism and the emerging role of electronic cigarettes; Volume Two describes basic molecular biology of nicotinism; Volume Three describes emerging biotechnology in nicotinism; and Volume Four describes chronic diseases associated with nicotinism and disease-specific-spatiotemporal (DSST) charnolosomics and charnolopharmacotherapeutics for the targeted, safe and effective personalized theranostics of nicotinism. This book is written primarily for readers interested in learning more about the basic molecular biology, recent biotechnology, and molecular genetics for diseases linked to nicotinism as well as their possible prevention and cure. A novel disease-specific spatiotemporal charnolosomics along with conventional omics (genomics, proteomics, metabolomics, lipidomics, and metallomics) with correlative and combinatorial bioinformatic analysis is proposed for the first time to accomplish targeted, safe, and effective personalized theranostics of nicotinism for a better quality of life. This book is written primarily for the health and well-being of highly vulnerable adolescents, who engage in drug seeking behavior (particularly tobacco and alcohol), become victims of chronic addiction, and suffer from poor quality of life, early morbidity, and mortality. Moreover, nicotine exposure during intrauterine life can induce diversified embryopathies (such as abortion, stillbirth, sudden infant death syndrome, microcephaly, craniofacial abnormalities, growth retardation, ADHD, autism, and craniofacial abnormalities) in developing infants; likewise, asthma, COPD, cancer, and infertility occurs in adults. 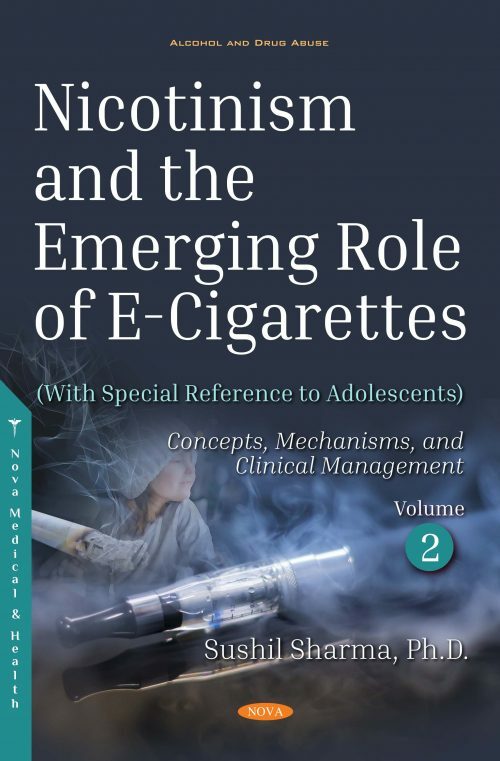 The primary goal is to minimize nicotine-induced early morbidity and mortality due to asthma, emphysema, cancer, heart attack, diabetes, obesity, infertility, major depressive disorders, schizophrenia, Alzheimer’s disease, and several other neurological and neuropsychiatric disorders, which are elegantly described in this book. Volume Two describes the basic molecular biology of nicotinism in two sections. Section One (“Concepts & Mechanism”) consists of seven chapters, while Section Two (“Clinical Management of Nicotinism”) consists of two chapters. While each volume will serve as a textbook for biomedical students and as a reference book for researchers, scientists, doctors, and professors, all four of the volumes systematically will certainly enhance the existing knowledge and wisdom regarding nicotinism and drug addiction in general. It is envisaged that readers (researchers, doctors, nurses, teachers, students (particularly high school and college students) and the general public will enjoy learning the most recent and novel personalized theranostic approaches currently being implemented in this clinically-significant discipline by carefully going through the most interesting and thought-provoking contents of this book.